It’s no mystery that brick & mortar retail has been struggling for the past decade or so. Just think of Circuit City, Tower Records, Blockbuster Video and numerous other defunct retail stores. We know that technology killed the record industry, but what about Home Theater? I mean, you can’t download a set of speakers for free, so why aren’t there more people spending money on sound systems? Hard copy movie sales are not what they used to be. The days of flourishing video stores that benefitted from the format war between VHS & Beta in the 80’s, followed by the digital age seem to be over. Even though the Laser Disc became available in 1978, it never fully took off competing against the much cheaper and convenient VHS. A new era arrived with the DVD which grew into another format war between Blu-ray & HD DVD. With each evolutionary step in technology, people had to buy another copy of their favorite movies. But after the internet was birthed, everything changed. Online sales and rentals began eating away at brick & mortar revenues until many stores went out of business. And once download speeds increased, people could stream DVD quality movies without needing a physical copy. Streaming has pretty much put the last nail in the coffin for widespread home media purchasing. The days of cd towers and a wall of DVD’s is an archaic reminder of the technological Darwinism we’ve experienced in relatively few years. A study produced by Animoto shows that among the millennial demographic, 48% watch movies exclusively on their mobile device. Compounding that figure is the fact most people listen to mp3s, preferring convenience over fidelity. And while there is a segment of people that use higher quality over-the-ear headphones, if you look around you’ll see most using those white Apple ear buds or similar. This just desensitizes them to the finer sonic elements that would lead to a good stereo system and on to a full surround setup. That’s not very good news for the future of audiophilia or home theater. Although many are becoming accustomed to less than superior audio fidelity on their mobile devices, the movie industry is bigger than ever. Both 2015 and 2016 had grosses that totaled over 11 billion dollars domestically, and the theater experience itself has only improved over the last decade. More luxurious seating, food & beverage service and improved sound & picture have been the trademarks with newer theaters. Also, let’s not forget the biggest advancement in theater sound since “surround sound” was invented: Dolby Atmos. Theaters equipped with this technology are increasing every year. Last year AMC announced that by the end of 2017 they would build 100 new “Dolby Cinema” theaters across the nation. This shows that audiences are embracing this technology and raises the bar for immersive sound. Atmos has also infiltrated the Home Theater. 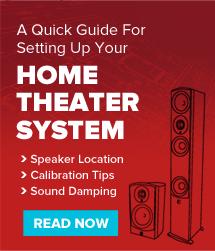 With nearly all major A/V receiver brands offering Atmos (and DTS-X) in their products, the home audio world has been ablaze with upgrades and adding of speakers in the ceiling. The sound quality of home media is also improving. With studios providing separate mixes specifically for home theater, rather than just passing on the theatrical mix. More attention than ever has been put into modern home releases. Televisions have been on a steady pace refining and improving picture quality for decades, and today is no different. Terms such as “nits”, “Quantum Dots”, “Nanocrystals” and acronyms like “HDR”, ”SUHD”, “4K”and “CCFL” have worked their way into the vernacular of many a tech-heads. These help to inflate our amateur part-time physics degrees as we learn more about fluid dynamics and photonic repercussions than any normal person would or should know. Humans are inherently visual creatures, so just about anyone with normal vision will benefit from these technological innovations being implemented into modern televisions. And once you have a beautiful TV, who wants to sit there and listen to those crappy built-in speakers? As streaming has taken over most of our media consumption, they have been slow to adopt the inclusion of surround formats. But, as these services grow along with increased internet bandwidth and speed, more companies like Netflix & Amazon (no Hulu) are increasing the availability of 5.1 – and even Atmos – in their streaming titles. Also, the standard audio format for broadcast HDTV is 5.1. So, we can expect to see more and more content in the future. Also the recent resurgence in vinyl cannot be denied. Watching these reappear in stores has brought a small tear to my eye. The visceral experience of tactile media and analog sound, especially though a worthy sound system, cannot be underestimated. We can only hope that future generations will come to appreciate the joyous eccentricities contained within this medium and continue to burn the torch of tone for years to come. After all, great 2-channel and great surround go hand-in-hand. One thing that is uncertain is the long term popularity of the home theater. While I doubt people will ever get tired of sitting in front of a great pair of speakers, the way technology is progressing seems to bring technology to a more and more personal level. As virtual reality finally starts to take off, unlike the 90’s would have had you believe in the Lawnmower Man movies which demonstrated a technology that ultimately proved itself impotent at the time, it will be interesting to see how audio follows. Will we find something like the “Sennheiser Surrounder” come back to life? Or will the technology integrate even deeper into our bodies? Samsung recently patented a contact lens that can record and project video, so perhaps we’ll have the audio equivalent to actually trick our brain into hearing true 3D sound through implantation in the tympanic cavity, cochlear nucleus or perhaps even directly into primary auditory cortex. However it turns out, we are certainly in store for some exciting times in the world of sound.